It’s been stated to death that the Sonic the Hedgehog franchise was in dire straits around 2004 – 2007. It’s that well-known that going into it here would result in me creating my own fan character; Beat the Dead Horse. But after the release of the edge fest Shadow the Hedgehog and the embarrassment that was the 15th anniversary headlined by the infamous Sonic ’06, it was becoming clear that Sega were dangerously close to killing the franchise if they missed their next swing. In 2008, we saw the release of Sonic Unleashed, a game that skipped the gimmicks and focused on giving people what they knew Sonic for, breakneck speed and a radical vibe pulsating through it. And then they thought “Screw it, let’s make him a werewolf.” Apparently, the developers and game’s director wanted to surprise fans and still keep them on their toes with what to expect. And arguably, given the state of the series with the previous games, that was way too big a risk to take. But there was always a chance it could pay off. Sonic Unleashed had two versions release, the HD version for PS3 and XBOX 360 and the Wii/PS2 version. Both are completely different in how they handle and stage design, with the only shared assets being the story and locations, although the Wii/PS2 is missing two stages. The story opens with the most glorious cinematic to ever kick off a story, right up there with the opening to Super Smash Bros Melee. The Blue Blur’s longtime rival, Dr Eggman’s latest plot sees him shattering the Earth into seven pieces with a giant space laser to release the evil eternal entity Dark Gaia to help him take over the world. Due to Sonic being captured in the machine firing the laser with the Chaos Emeralds powering it, Sonic is corrupted by Dark Gaia and transformed into a “Werehog” with the emeralds drained of their power. With the planet in fragments, Eggman ejects Sonic into space, hurdling towards the Earth. Caught by an unseen force, Sonic survives his fall (cause never mind burning up on entry into the atmosphere – but I’m not a man of science and this has all made enough sense so far to my feeble mind), but injures a small creature, giving him amnesia. Feeling responsible, Sonic names the creature Chip and takes him on his journey to cure his werewolf condition, restore the planet and get Chip his memory back in the process. Believe it or not, I’d classify this as a damn good story for what it is. The premise might be ludicrous with the whole Werehog thing, but the cut scenes are fun with the right amount of levity a story about a blue hedgehog who runs fast and his Spyro NPC looking friend should have. It has its fair share of comedy and cartoon antics, but it also has some depth to it. The friendship between Sonic and Chip is the perfect amount of wholesome without getting too cheesy. Chip acts as a great device to showcase Sonic’s core character, someone who’ll help anyone just because he can and this all comes together beautifully in the scene at the pier, that gets me every time. 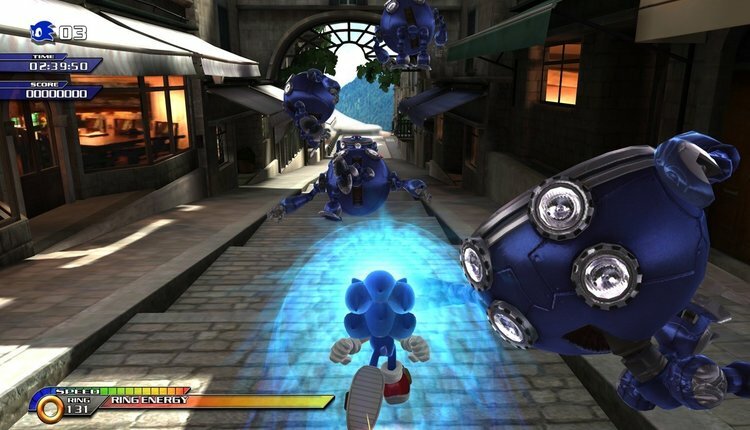 Gameplay for Sonic Unleashed is split into two main sections, day and night stages. Day stages are the clear highlight of the game where you control Sonic blazing through miles-long stages at impossibly thrilling speeds. Sonic now has a boost, seen in later games Sonic Colours and Sonic Generations, that keeps the speed going, in the HD version the boost button can be held down and is powered by rings, so it’s almost always nonstop apart from platforming sections. Whereas in the Wii/PS2 version the boost meter is segmented, with each use lasting a few seconds. Whichever you prefer will come down to preference. The HD version offers incredible speeds that aren’t beginner friendly at first, but once mastered are very engaging and fun. While the Wii/PS2 version is easier to get the hang of, encouraging strategic use of the boost to get the most out of it. But at the end of the day, they’re both great fun. Unfortunately, with the end of the day comes the night and the night time stages simply aren’t as fun. The Werehog stages are comprised of beat ‘em up sections and slow paced platforming. Here’s where Sonic Unleashed suffers, the Werehog sections are too slow and too long. The beat ‘em up aspect is fun in short bursts, there’s a decent number of combos, even if the most standard ones are fine for the entire game, it’s still fun. But they go on and on and on and on. These stages can last between 8-30 minutes a piece. The Wii version breaks them up into acts but even they can last up to 10 minutes each with sometimes 4 or 5 back to back and it’s just hell. If these stages were 5 or 6 minutes a piece they’d be fine but it’s honestly their length that drags them down. At their best they’re fun enough, but that doesn’t cage the fact that I was never happy to see one. The Werehog boss fights are at least pretty fun. A day stage in Sonic Unleashed. Source. Visually, Sonic Unleashed is the best game in the series and even surpasses some games on current gen systems. The CG and in-game cut scenes are Pixar quality. Gameplay never stutters and character models are great. There’s honestly not a single downside. This is all the HD version though. The Wii/PS2 versions look nice for the system but there’s no comparison really. The Wii/PS2 version also uses static jpegs for talking head dialogue scenes, which always looked really cheap. Quick mention has to go to the soundtrack. Sonic is known for his games having killer tunes but Sonic Unleashed really packs a hefty punch, delivering one of the series’ best. Check out Rooftop Run, Dark Gaia Phase 2 and Cool Edge Day, you won’t regret it. Overall, Sonic Unleashed is a damn fine game on both systems. Whichever you prefer will come down to preference (personally, I prefer the HD version) but both give a good time. Unfortunately, the Werehog does drag the whole package down but not to an unsalvageable level. The day time stages and Werehog boss fights are enough to recommend the game. And once the main game is finished, going back to replay day stages for better times makes the whole gameplay journey worth it. Dan is currently in his final year of journalism at DCU. Focusing his writing on the entertainment industry he discusses films, gaming and sometimes televison. Often found in his room writing, gaming or having his 5th cup of tea of the day. He is the former co-host of Near FM's 'The Film and TV Show' and recorded some podcasts in his time. Dan also has a wordpress blog called 'Dan's Digest' where he primarily covers professional wrestling, films and gaming.